Microsoft's ambition for Windows 8 has, for the most part, been realised. The Redmond outfit's latest operating system has a Modern UI that's ideally suited to the increasing number of touchscreen devices, and alongside that there's a desktop that's more powerful than ever before. Fair enough, the two don't mix together particularly well, but Microsoft now has a genuine solution for anybody in the market for either a tablet, a laptop or a desktop PC. Windows 8 ultimately ticks a lot of the right boxes, but what about performance? Windows Vista felt sluggish and Windows 7 was comparatively fast, so where does Microsoft's latest fit in? Knowing that the 2012 revision has so much in common with Windows 7, we're not expecting to see huge shifts in performance - in either direction - but we won't know until we try. To find out, we've run a series of benchmarks on our third-generation Intel Core i7 test platform - first with an up-to-date 64-bit install of Windows 7 Home Premium (including all the latest drivers and SP1), then secondly with a 64-bit install of Windows 8. Our system specification (detailed in the table on the right) is far in excess of Microsoft's minimum requirements - which, remember, are identical for both Windows 7 and Windows 8 - but we're looking to see if there are any noteworthy performance gains to be had. We'll be taking a close look at how most of the components in our test system fare under each operating system, but let's get started with a straight race: booting, shutting down and restarting. 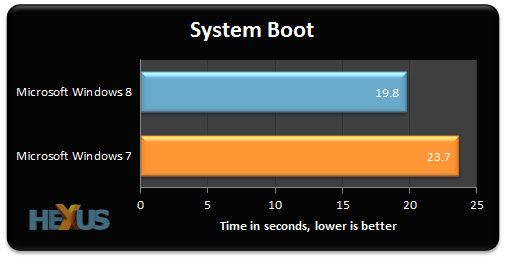 Windows 7 is no slouch at starting up, but there's no doubt about it, Windows 8 is quicker. We see a start-up performance increase of over 15 per cent on our high-end test system. Note that the test Gigabyte motherboard takes the best part of 10 seconds to complete the POST process, meaning that Windows 8's actual boot time is significantly quicker than 7's. 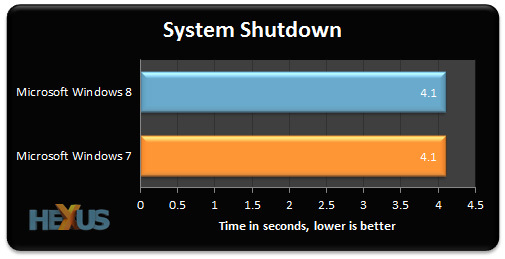 Neither OS drags its heels when shutting down, and we see no noticeable difference between the two in this test. As expected, and in keeping with start-up performance, Windows 8 has the edge when it comes to restarting and getting back to the desktop. 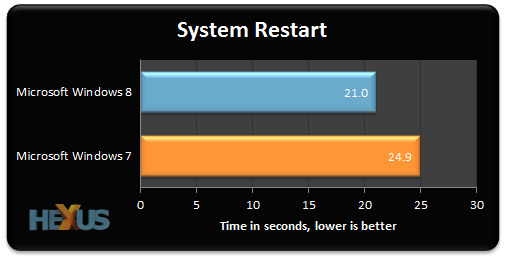 On average, Windows 8 was able to restart 15 per cent quicker than the same PC running Windows 7.